This “white [male] middle-class cultural hybrid’, as he has described himself (‘Guilt & Innocence’), has made some of the most strikingly original post-colonial sculpture you can find. Deceptively light in tone, he can make you laugh like no other, but like the best cartoonists his work can be read at several levels, resonating long after the initial punch. Murray’s first mature body of work emerged during the repressive 80s, while sequestrated at university (he spent nine years there, like many other war resisters who became ‘perpetual students’). By situating his early work within the history of caricature, Murray ‘universalised’ his subjects, while retaining enough specificity to mock Apartheid and its icons. He was an artist in the tradition of Goya, Daumier and Grosz, not an anti-apartheid upstart. Referencing historic (artistic) precedent is a familiar device for satirical artists, especially in times of censorship, and has resurfaced in some of Murray’s recent work. An example of this is when he adopts the staid, allegedly neutral look of a New Yorker cartoon, while making references to “brown-nosing the president”, which in the contemporary South African situation can take on a much more specific identity than implied by its (deceptively) conservative rendering. 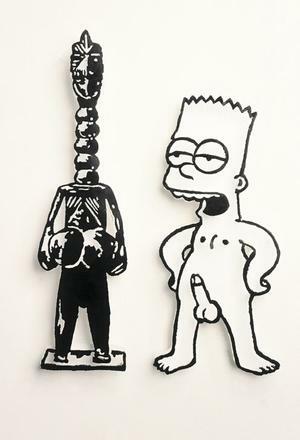 On a formal level a constant feature in Murray’s work is his appropriation of sources from mass media and popular culture such as cartoon characters (eg. Bart Simpson, Richie Rich, Pink Panther); capitalist/consumerist icons (eg. Col Saunders, Oros Man); Afrikaner icons (eg. Voortrekker monument); touristic imagery (eg. postcards), and visual stereotypes (as rendered in cartoon styles, eg. Tintin & The New Yorker); and snap shots (eg. his own family album). Paradoxically his use of external sources (‘popular’ imagery) has resulted in the development of a very distinct personal style, making Murray one of the most easily identifiable of South Affrican artists. A key part of his approach to his source materials is to disrupt their original context, exagerate their sense of scale and juxtapose them with apparently contradictory elements, throwing up a third, hybrid, synthesis, that is often more open-ended than conclusive. Another, less visible feature of his work is the “suggestion of a caricatured self-portrait, running as a kind of leitmotif through Murray’s work” (Powell, p7). This strategy runs through much of his work, and was first evident in the 80s. However it goes beyond formally referencing a particular ‘body-type’, and includes the appropriation of (cartoon) icons which personify an anarchic spirit that the artist has some affinity with (eg. Bart Simpson, Pink Panther). 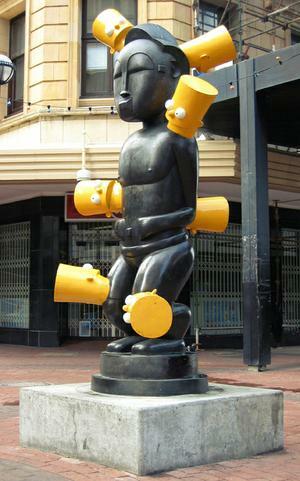 Seen in this light his public sculpture Africa, (where an enlarged figure, modelled on west and central African sources, is ruptured by a series of Bart Simpson’s heads) is not only a jarring representation of two cultures in conflict, but also an expression of how the artist ‘sticks out’ as a ‘white African’. That Bart is in fact yellow simply adds to the absurdity of ‘white’ in the same way that Murray sometimes uses pink and brown when dealing with notions of ‘black’ and ‘white’. Warrior, where the Pink Panther holds a Zulu shield, is another example of how Murray’s work can be read at different levels. Superficially it makes a similar point to Africa, an apparently incongruous justaposition of discrete elements, and it pokes fun at those who wear their Africanness as an accessory. However in the South African context it can also be seen as sharply political, as the Zulu shield is a (tourist) icon representing (pre-colonial) Zulu military might, and is closely aligned with the Inkatha Freedom Party of Gatsha Buthulezi. Read in this way ‘Warrior’ can be seen as mocking the IFP as an essentially ‘Zulu party’ with some conservative whites occupying strategic positions. It can even be seen as a ‘portrait’ of one of these ‘pink Zulus’. On the other hand it condemns the IFP for having betrayed the black majority by collaborating with the Apartheid Government, including on the military front. That it could have been a ‘black panther’ is hinted at by the black ‘shadow’ that covers one side of its face. The shield, held rather limply, does nothing to protect the otherwise exposed panther. That Warrior defies one conclusive reading, whilst being almost emblematic in its form, explains why a ‘cheap joke’ can retain intrigue long after the initial shock (or giggle). Aother important feature of Murray’s work, and one in sync with his iconoclasm, is his neo-dadaist use of materials, which in turn is countered with an almost conservative emphasis on craftsmanship. He has painted bronze to make it look like the painted wood of tourist oriented, colon sculptures from the Congo (the Bubble Head series). He has also painstakingly recreated the look of black ink on paper using wood and plastic in one series (eg. Another Other), and cut out sheets of metal in another (eg Crisis of Identity). That he relishes innovative approaches to materials is evident, and the decision to task him to set up a sculpture department (at the University of Stellenbosch) was clearly an inspired choice. The missing link between popular cartoons and ‘fine’ art, Murray has also made many functional works, including some of the funkiest lamp shades ever, making his works accessible to a wider market. He bravely goes where others may fear to tread, and is fast becoming recognised as a national treasure, finding his way into virtually all the prominent public and corporate collections in South Africa, and finally receiving recognition as Standard Bank Young Artist of the Year. International curators are increasingly taking note, and the world will see much more of the other Bart.